My call time is noon and I am freaking out...I don't even have any actually lines today...haha nope...I say NOTHING....I guess I am just excited nervous... I haven't actually met the cast but I have heard that everyone rocks...including the kids in the film..I'm excited to see who my "son" is hahaha. I love the demin shirt!! Can i borrow it?! Haha jp. Good luck today on set! You will do great! Just picture everyone in their underpants lol (it never worked for me, but it might work for you lol). Congrats on being in the movie! It sounds like it's going to be funny. As for your outfit...you know it's fab, girl. Love the denim top and those skinny olive jeans. It's a great look! Love the outfit! Completely fantastic. Hope that everything was completely terrific today! This is different Shana. I'm so used to seeing you in skirts or dresses so this is a great spin! Love the olive green skinnies-they can easily be thrown into your fall wardrobe-I have them in about two or three different shades!! Wow I'm loving your blog..and your outfit is simply casual and cute. Love these pants! They look great on you. Good luck with your movie! Best of luck to you and girl I love your shoes! Fab! I find it so difficult for me to pair a denim long sleeve up with anything but you've convinced me other wise. 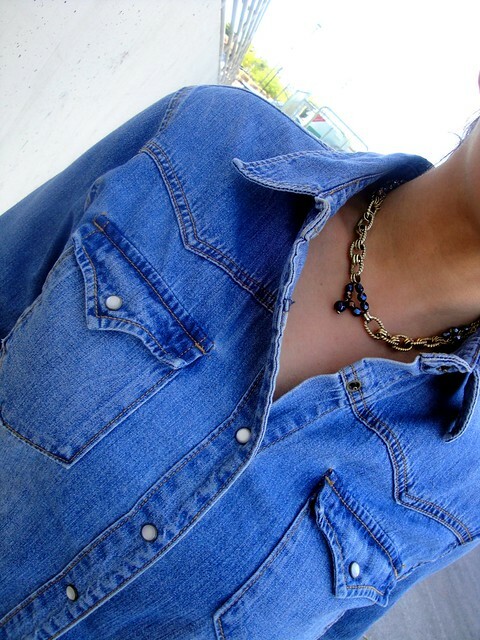 I have a denim shirt hanging in my closet with a tag still attached to me. I may have to try it this way. Thanks! Love the color of those skinny jeans!